We sell so many fabulous new pianos, our stores get a continuous stream of excellent pre-owned – used pianos in trade from all over Los Angeles, Orange County and Ventura County, including the most popular brands, such as used Steinway, Yamaha, Baldwin, Kawai, Pearl River and many more. We recondition the pianos, tune them up and offer a wide array of models and prices. Our used piano inventory is always changing, so visit often to find your perfect piano. You can search by store location, brand or style of piano such as grand, upright or digital/electric. Details: This 1938 Minipiano has a surprisingly rich , full sound, with a brilliant treble and a growly bass. It’s a wonderful piano for someone with extremely limited space or an eye for Deco furniture. These little pianos were designed by an English company called Eavestaff, and manufactured exclusively in the U.S. by Hardman Peck in New York. They are a unique design, and quite rare. Details: This Kawai upright console has a beautiful Queen Anne style cabinet to compliment its great touch and sound. Details: At 43" this Pearl River is the perfect size and has a beautiful look that will make a great addition to any home. Details: Weber pianos are a popular choice for students, home enthusiasts and professional musicians alike. Details: This 43" Eterna is one of their most sought after models both for its modern look and great feel. Great for homes and schools. Details: This elegant, high performance piano is the perfect combination of size and sound for professional studios, conservatories, and institutions, just as much as it is suited for the home. Details: This mid-sized Yamaha baby grand plays great and is in excellent condition! Details: This is a great starting piano for a new student and family looking for affordability, and it comes with a 10 year warranty! Details: This wonderful 5' 3" baby grand piano was built in 1985 and has been reconditioned. Very little home use, looks and feels brand new. Details: 1982 Yamaha U3 upright in polished ebony. 52". Reconditioned. Excellent touch and tone. Beautiful condition. Details: This Yamaha baby grand is in excellent condition. It has a great touch, a nice mellow bass with a pleasantly bright high register. Details: 2004 Mint condition. Minimal home use w/ Artist bench. Details: 2005 Story & Clark Grand Piano in Satin Ebony Victorian Style. Details: This piano would pass for brand new. Very clean inside and out. Details: Near new condition used console piano in a natural wood furniture cabinet. Young Chang is a good quality builder out of South Korea (at the time this was made). Details: Mint new condition digital baby grand with 88 fully weighted piano action. Piano works perfectly. Details: This Yamaha grand is in a charming satin finish. It is in great condition with a lovely sound and touch. Details: The Yamaha C3 (6’1″) model has been long recognized as one of the most desirable grand piano models to be offered world-wide by any piano maker. Many artists, schools, teachers, students, and at-home hobbyists choose Yamaha because of the refinement of the action and consistency of performance. This model was fully built and assembled in Japan. Details: This beautiful Baldwin Hamilton studio upright is in good condition with great touch and tone. Details: 5'2" Baby Grand, great practice piano. Details: 4'9" Baby Grand, great practice piano. Details: This Kawai baby grand is in excellent condition, with a responsive action and a beautiful tone. Details: This popular Yamaha U1 model piano is a professional studio upright piano in excellent condition, featuring a pleasant mellow tone. Details: 5'8" parlor grand, reconditioned. Details: 5'8" parlor grand. New Hammers! Details: This gorgeous grand piano is in excellent condition, featuring a well rounded, beautiful tone. Details: This Yamaha upright is in good condition, with a bright crisp sound and tone. Details: Circa 1916. 100% restoration done in 2006. Details: 5'3" New Strings Complete Reconditioning. Details: Circa 2004, Like new condition. Details: 1982 Kohler and Campbell 5'11" grand. Details: 1986 Young Chang G157 (5'2") grand in polished ebony. Details: 1978 Yamaha C3 (6'1") grand in satin ebony. Details: 1984 Tokai G150 (4'11") grand in polished ebony. Details: 2010 Essex EGP155 (5'1") grand in polished ebony. Details: 1997 Kohler and Campbell SKG400s (5') grand in polished ebony. Details: 2004 Yamaha DC3 Mark 4 (6'1") Disklavier grand in satin American walnut. Details: 2000 Steinway model L (5'10") in polished ebony. Details: Instrument in great condition in and out. Nice easy action with a much bigger sound than it should have for an apartment piano. Details: This pre-owned Yamaha U3 - 52" Upright Piano in Polished Ebony was mistaken to be new by a customer the day it arrived! The NEW MSRP for this today is $14,599 and offered pre-owned for $5,999. Our pre-owned Yamaha U3's come with a 10-year parts warranty and 100% trade-up option and SELL VERY QUICKLY! Details: 1980 Steinway & Sons Louis XV Model "M" 5'7" Walnut Medium Grand Piano. The Louis XV is still one of the most coveted Steinway & Sons pianos ever made. This piano has been very well taken care of and is the very epitome of what this legendary piano is known to be. A new model will now list over $130,000. Before you make a decision - you owe it to yourself to see this! Details: 1981 Yamaha G1 Satin American Walnut 5'3" Baby Grand. This traditional baby grand has been completely refurbished and will come with a 10-year Parts Warranty. This Yamaha is in TOP shape and sounds GREAT! The new version of this lists for $30,599. Details: Built in 2005 in China...this small baby grand has a nice sound and is in like-new condition! Good 5' Practice Piano. Details: Sohmer 50TD Grand, Reconditioned. Details: Perfect condition Yamaha Disklavier baby grand model C2 Conservatory series. The finest baby grand Yamaha makes, with the most advanced Disklavier they've ever designed. Compatible with Yamaha disklavier radio and TV, can be played with headphones, records performances, and has a massive library of Music built in. Includes all original accessories. Details: Steinway A Grand, Circa 1913, Complete Restoration. Details: 1978 6'1 Yamaha C3 in Polished Ebony. Reconditioned. Beautiful condition. Excellent action and sound. Details: Circa 1988, Reconditioned. Built in Korea. 5' 9"
Details: Circa 1990's, Reconditioned. Large full tone. Details: Circa 1976, new hammers key bushings in 2014. Reconditioned. Details: Circa 2012. A member of Bosendorfer's elite "Ultimate Design" series, this gorgeous body design with maple rim, lid, and prop stick demonstrate why Bosendorfer is considered the crown jewel of piano craftsmanship and design. This piano is in like new condition. Certainly a must see. Details: 2003 Hallet, Davis, & Co. - 5'0" Grand Piano in Polished Ebony. 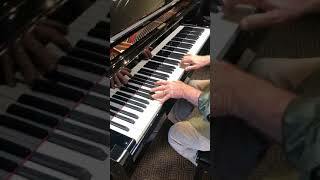 Great practice baby grand, for the price of an upright. 10 year parts guarantee. Details: 2007 Yamaha C7 7'6" semi-concert grand in polished ebony. Fully reconditioned. New strings and hammers. Superior piano, the famous Yamaha C7 is one of the most sought-after semi-concert grands on the market. For concert halls, jazz clubs, recording studios, or in the home. Details: Factory refurbished Yamaha Disklavier grand piano. Brand new C3x model, full factory warranty, you save $17k at this price. Finish: Satin Rosewood. Open Pore. Details: 5’ 7” Circa 1982. Built in Leipzig. Reconditioned. Stunning and rare finish. Details: The Yamaha S4 is a super rare Yamaha model hand built by Yamaha's finest Craftsman. The Disklavier allows for recording and playback from Yamaha's massive music library. Upgraded to Yamaha's E3 technology. Details: Excellent condition plays wonderful sounds great built in Yamaha USA factory. Details: 2010 Essex - 5'1" Grand Piano in Polished Ebony. The Essex is the entry to the Steinway lines of piano. This model new sells for $12,000. This one is only $5,599. Details: 2000 7' semi-concert grand in satin ebony. Reconditioned. Excellent, like new. Details: Yamaha U1, 48” upright Piano. Polished Ebony. 1985. One of Yamaha’s best upright pianos! Reconditioned with 10 year warranty. Details: This piano plays and sounds as beautiful as it looks. This Steinway & Sons 1989 Model M has been taken excellent care of and is offered with a 10 – year parts warrantee which is double of that offered brand new by the manufacturer. One could pay over $83,000. for this if new and if this has your interest - you know that used Steinway & Sons pianos are in high demand. This piano is being offered at an incredible price. Plus delivery and applicable sales tax. One needs only to see and hear this piano to understand what an opportunity it truly is.